It’s three o’clock. Your product development team meeting has just ended. And here you are in the break room with most of the other team members. First, few ideas are great to begin with. They have to be questioned, critiqued, improved, developed, and then compete with other ideas for support, commitment, and resources. Second, few people have been well-trained in the skills that enable them to work with their own and others’ ideas in a tough, honest, competitive, yet collaborative way. And third, organizational politics, tribal loyalties, and human emotions such as fear of loss are a powerful, yet sometimes invisible, factor in communication and decision-making within organizations. In a time when innovation; i.e., creating value from an idea that is new to you, is key to the success of many organizations, high-quality ideas are a valuable currency. They are the raw material for innovation. Paul Romer, winner of the 2018 Nobel prize in Economics, has shown that new ideas are the fuel for long-term economic growth and that organizations need to invest in research and development and support improved patent laws to encourage innovation[i]. Those investments can best pay off when potential innovators thrive in welcoming environments. Organizations that can’t respond with new and powerful ideas to customer needs, changing technology, social and cultural movements, competitive pressure, political or environmental crises, or unexpected opportunities risk obsolescence. While generating ideas is not often part of a formal job description, it’s hard to think of a job where the skill wouldn’t be relevant. Anyone who has worked in an organization will be aware that a large proportion of problems front-line employees face will never reach the senior executive level. It’s common wisdom that those who are closest to the problem or opportunity are in the best position to deal with it. If the only person with the responsibility and permission to generate ideas is a formal leader or designated professional, there are probably too many people in the “room.” Any organization can benefit from a workforce that is both expected to be and skillful in being creative and forthcoming with suggestions and proposals. Organizational or team cultures that discourage disagreement and debate risk missing ideas that could transform their business results, create greater efficiency, or help them to become a great place to work, attracting the best talent. Those ideas, or the seeds of them, walk out the actual or virtual door of their company every day between the ears of team members. Worse, ignoring, not requesting, or not providing honest feedback can lead to disastrous results – financial or otherwise. Serious errors of judgment can and do occur when people assume that those who are senior in rank or experience cannot be questioned. When people with unusual or unpopular ideas and opinions are silenced, directly or indirectly, disasters can happen and do happen. When alternative solutions and/or critical feedback are not invited or welcomed in an organization, it’s almost inevitable that certain consequences will result: Resources will be wasted on mediocre ideas that fail or don’t perform as hoped and talented people with better ideas will take those ideas elsewhere. 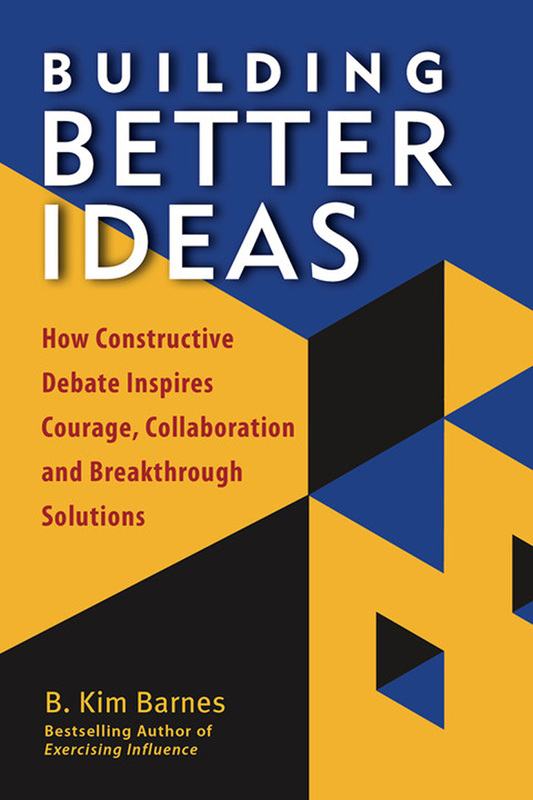 At the same time, many team members have little experience, skill, or confidence in their ability to speak up, to disagree, and to initiate or participate in a robust discussion – what we will come to call a “constructive debate” – one that can lead to better, stronger, and more successful ideas. Are teams in your organization making great decisions? Do they consider alternative, even competing, points of view before they decide? Are the right people invited in to the process and listened to? Do team members build on one another’s ideas to improve them? Do teams avoid playing politics and instead keep a rigorous focus on developing promising concepts and solutions? Do members avoid defensiveness and ask for feedback? Can creative, unusual, and even risky ideas get a hearing? Can people disagree and remain good colleagues? Or, is your organization one where “the meeting after the meeting” is the norm – where people express their real opinions after they have allowed a suboptimal or mediocre idea to move forward? Is it an organization where people hesitate to disagree openly with conventional wisdom, where fear of conflict or failure means that potentially great ideas may never be expressed? As a formal or informal leader, you are in a position to help change the culture – the norms and practices that govern the way people behave. As a trusted advisor, business partner, organizational consultant, coach, change leader or facilitator, you can support and promote a culture where “constructive debate” becomes the norm. identify, explore, and develop promising ideas. You’ll learn about how an organization can experience a culture change through applying this process and have an opportunity to practice some skills and outline a design for a constructive debate that needs to occur in your organization. In the book, we explore the concept and practice of “constructive debate,” and ways that you can implement, facilitate, and support it. We examine how organizational culture and leadership behavior can affect individuals’ willingness to take the risk of contributing unusual or creative ideas or to critique and improve suboptimal ideas before they are implemented. In this time, where opinions can be tribal, and differences can lead to unconstructive conflict, it’s important to find ways to build robust ideas through a thoughtful, fair, and inclusive process. You can help that to happen. Browse the Barnes & Conti Resource Library for more articles on leadership and constructive debate. Gain access to more articles like this by registering for our resource library! Thank you for registering for the Barnes & Conti Resource Library.